2014 What did you eat from your garden today? 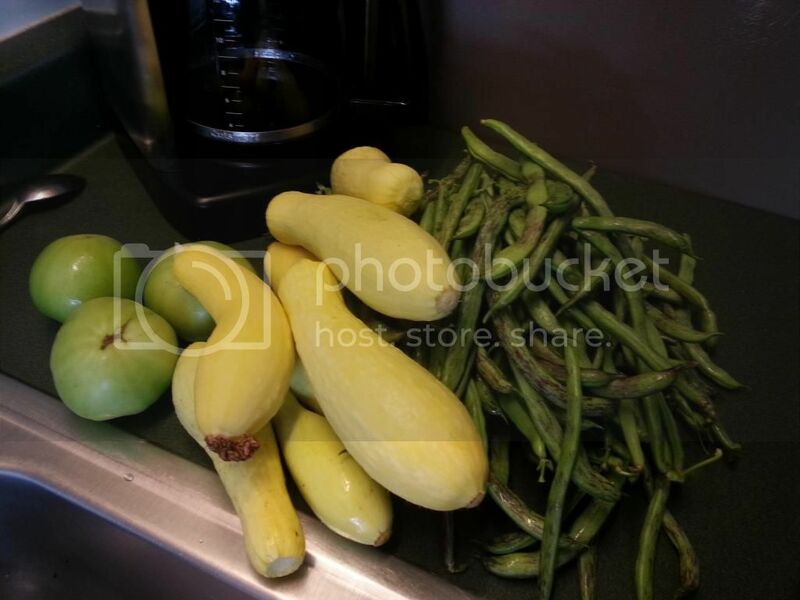 Re: 2014 What did you eat from your garden today? My garden was NOT productive this summer but I just made soup with cannelini beans from my mom's garden. Very delicious! My son and his family are visiting from North Carolina. They really enjoy fresh veggies, so I was glad the garden gave us some produce for a great meal. Oddly enough, our daughter in law gave us a gift of Fried Green Tomato batter. So glad we were able to try it out. Lindsaylew82 wrote: When green sausage gets ripe, it turns very very yellow. The stripes stay green! They stay pretty firm. Very low water. I was so close! But I decided to wait based on your advice. Sliced up an un-identified store-bought organic heirloom instead. Today, I got 3 strawberries, and, the fledgling birds and their parents moved out, leaving me a lone raspberry in payment of rent for the ledge where they nested. Harvested some kale and chard to sautee for greens with dinner. They look like this when they're ripe! My husband's absolute favorite!!! Did you get your green sausage yet?! We had our second one. Both grainy...meh. 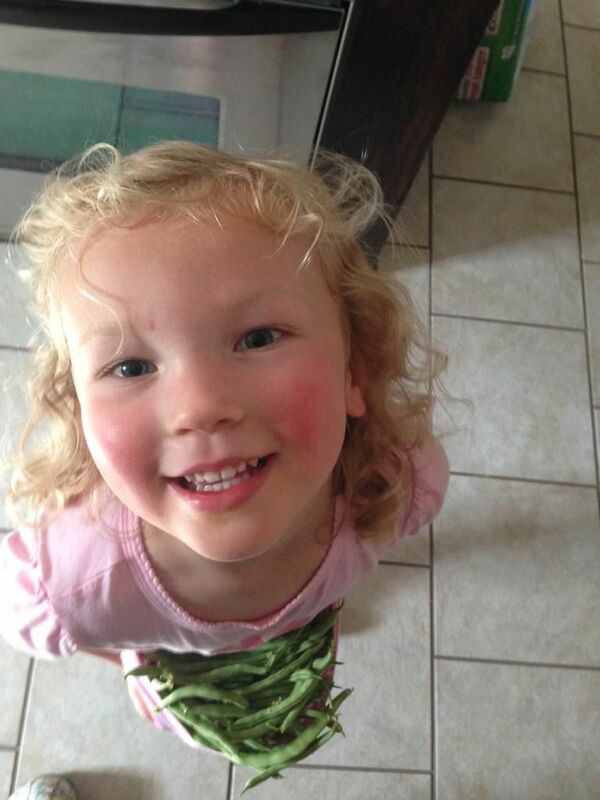 Kid said she wanted green beans for supper tonight while we were on the way home from work. She's in luck!! I went out thinking there were enough to give her, and ended up with her little shirt full of them! First time she got to pick anything! She thought it was great fun! She liked breaking them up too! We got enough for a side dish tonight and for our lunches tomorrow! We also picked about 10 good sized yellow squash. I sautÃ©ed them and had them with our beans, a few cherry tomatoes and some quinoa! It was yummy! And I had a great time sharing this experience with my daughter! I picked 3 more in the last couple days. More are coming, but that first one teased me by being way ahead of the others. Here's how it looked when we ate it. And yesterday, we had enough tomatoes assembled to have a real tomato taste test! Clockwise, from top center, Zluta Kytice, Heinz 2653, Indigo Rose, Yellow Pear, Sweet Million, Gold Nugget Cherry, Orange Icicle, Black Plum (awesome), Cream Sausage, Tumbling Tiger, Green Sausage, Indigo Kumquat. I have a black plum but it's called brown berry. The first is ripening on the window! I ate nishime (Japanese vegetable stew) using the dasheen that I grew. I also had cucumber and tomato salad with my first cucumbers and cherry and beefsteak tomatoes from the garden. I have a zucchini in the frig, still thinking what I am going to do with it. I have pak choi, papaya and one fig waiting for me too. cucumber salad with some of our Japanese cucumbers. We're currently harvesting snow peas and the broccoli is coming in as well. The summer squash are starting up too! Mmmmmm... Now I'm hungry. Imma have to make some bread this weekend and save up my cherries. Your tomatoes look like gems on that plate, grrlgeek. So pretty! We're just nibbling broccoli greens while we wait for the side shoots to get a little bigger. I could probably start eating some of my eggplant. There aren't a lot of good photos online to tell me how big the variety is supposed to get. sigh work day and then a lecture in the evening. I'm about to go from one to the other. I won't see my garden today, except I always go out on the deck before work in the AM and deadhead flowers and greet the day. Generally what I'm eating from the garden is lettuce, kale, chard, broccoli, cabbage, celery, herbs. I have some tomatoes that are blushed and peppers that I could pick or let get bigger. I could start thinning carrots by eating the babies. I read in your garden progress that you're growing Mangan eggplant? I almost picked that this year, but opted for Rosa Bianca and Lao Purple Stripe for my purples. I have never grown any eggplant successfully before so I studied hard all winter to do better this year. Size is less important when testing for readiness. As long as the skin still has a shiny appearance you should be fine, but once it gets dull, you've missed your window and they will start getting bitter. "Harvest eggplants when they are young. Size is not always an indication of maturity. To test, hold the eggplant in your palm and gently press it with your thumb. If the flesh presses in but bounces back, it is ready for harvesting. If the flesh is hard and does not give, the eggplant is immature and too young to harvest. 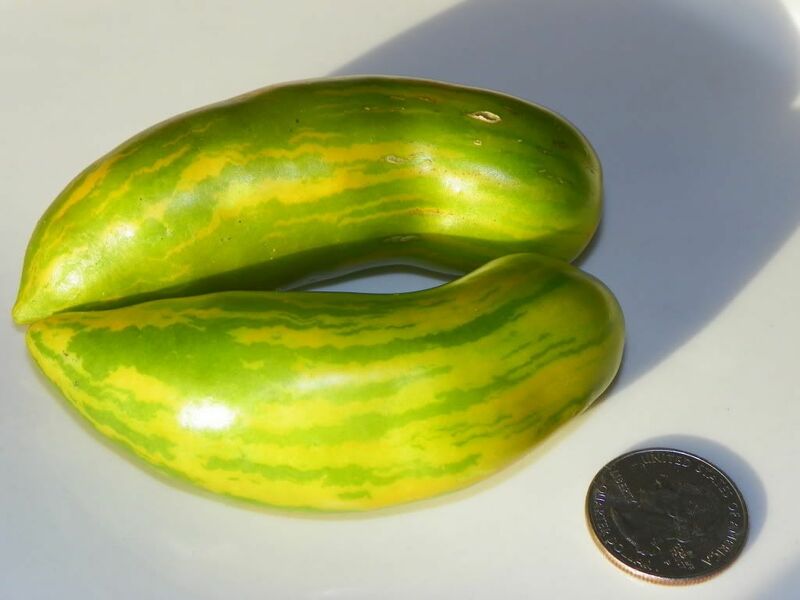 If the thumb indentation remains, the eggplant to over mature and may be completely brown inside and bitter with large tough seeds." The Japanese varieties are exceptionally sensitive and perishable. You can maintain freshness longer by rapid cooling to 50Â°F immediately after harvest. Also - don't put them in the fridge, but if you do, don't let them sit in there more than a couple days. I pulled my first Casper and Lao White eggplants just a little while ago. I am so excited. Trying to decide what to make out of them! The purples have only just set fruit this week so that's going to be a long wait for me. Let us know how yours fare! Yum back at ya! I will expand my toast horizons and make that as the side dish for whatever I make out of my eggplants!